Navicat backup is an integrated function of Navicat, a commercial tool with a bright and somewhat irritant graphical interface, designed to manage and administer different SQL databases including MySQL, MariaDB, MS SQL Server, Oracle, PostgreSQL and SQLite. To complete your set of instruments for an effective SQL database management, we recommend adding a perfect SQL backup software, such as Handy Backup, to Navicat. Unlike some scripts and solutions, Navicat is not a freeware. It has a heavy price tag, starting, for example, from $349 for Oracle and MySQL solutions. Therefore, a Navicat database backup is not a free addition to your SQL management functions when you are using Navicat. It is a strictly manual process, just as for phpMyAdmin utility. No methods to execute Navicat auto backup are existed. When performing backup, Navicat can “lock” a database (a sort of “cold” backup) or use it in “unlocked” state, with a risk for losing some transactions. Due to brighter and smarter GUI, Navicat can simplify the administering of a database, compared to more popular phpMyAdmin utility. It can be described as a solution roughly equal to HeidiSQL by most parameters (excluding, of course, the heavy price tag). Navicat has a manual backup tool. It can save any database (with a compression if a user needs it), marking a backup copy with some comments. For InnoDB data storage engine, an option of single-file backup is also available. 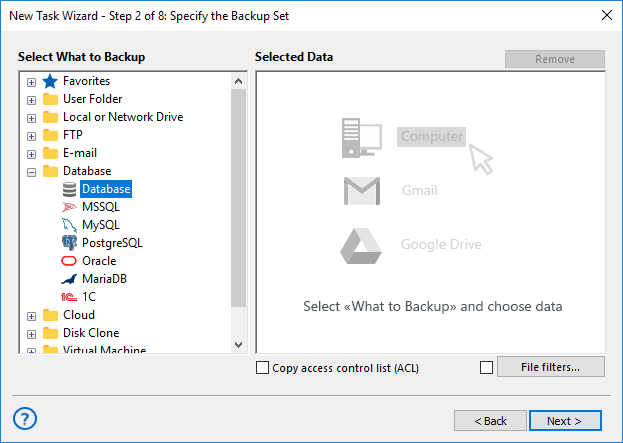 By contrast, Handy Backup has a set of automated backup instruments for any database existed. Priced at $249 for a whole toolkit (compared with a $349 for Navicat capable to back up databases, but no other data! ), it allows saving much money when matters touch a database backup. Backing up and restoring any type of server-level or user-level data, not just databases. 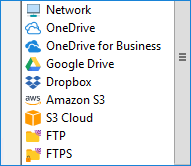 All these functions allow creating and maintaining backup strategy for local and remote databases of any type, as well as for any other information like virtual machine arrays or data server FTP directories. User can control the program via the clear, comprehensible graphical interface. If you need to manage SQL databases and are looking for a SQL backup tool, then you need Handy Backup Small Server. 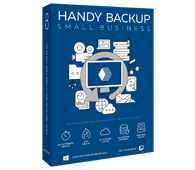 Try our small business backup software free for 30 days! For a convenience, we are shortly describing other popular database managing solution, compared with Navicat in terms of pros and cons. In addition, for obvious reasons we are also mentioning any backup capabilities of each tool here. A popular database-administering tool, phpMyAdmin is often included as a part of cPanel interface for many websites and remote database services powered on MySQL. Pros: phpMyAdmin is a free utility. It has a whole range of basic administering functions. Cons: phpMyAdmin lacks an automation of any operation, requiring only manual job. Backup capabilities: phpMyAdmin can back up or restore any MySQL database in a manual mode. This program is also freeware. Among the capabilities of HeidiSQL are managing MySQL and its forks (MariaDB and Percona), PostgreSQL and MS SQL. Pros: HeidiSQL has a bigger set of functions than phpMyAdmin, as well as friendlier interface. Cons: As phpMyAdmin, HeidiSQL lacks an automation, especially for backing up data. Backup capabilities: HeidiSQL can save or restore any MS SQL, MySQL or PostgreSQL database. Working with MySQL, this utility lacks almost any flaw typical for other DB administering utility. It has some instruments automating the data-managing process. It has a free “community” edition and a more capable “standard” edition requiring an annual fee. Pros: MySQL Workbench has a great set of managing tools, including visualization. Cons: Perhaps a limitation for MySQL database managing only. Backup capabilities: MySQL Workbench has some automated backup functions (again, for MySQL databases only). A price tag for Navicat is heavier than for any other instrument listed here. In addition, a fancy GUI and an absence of automation can make Navicat somehow difficult to use on a daily basis. Therefore, we recommend administering data with Navicat but backing up using Handy Backup!